Still in April, hot, two in the afternoon, an elegant Beverly Hills street. I get out of my friend Maurizio’s car, looking for todays character’s villa. The villas on this street make you think that only Hollywood stars can afford this beautiful homes: I think to myself: “Dante, look where we have arrived with the Mano Artigiana project”. But today is a special encounter and I want to enjoy it. I think of when I was a child, the name of the actor that I’m meeting, the last Hollywood legend and when my friend Andrea’s dad used to mispronounce his name, It’s very typical for romans. I imagined that his dad was with me, the big Ernesto. Today he would have told me: “Where are you going to Kirche Dagla?”Yes Ernè but is spelled Kirk Douglas. While I think of Ernesto’s smile, the door of the villa opens up. We go in, the maid takes us to a beautiful living room with a French window that overlooks the pool. On the wall the posters of Touluse Lautrec, pictures of Rome, bronze sculptures between art and cinema book. Photos of his son Michael, his wife and nephews. A very informal and welcoming atmosphere. Very, very pleasant and elegant. 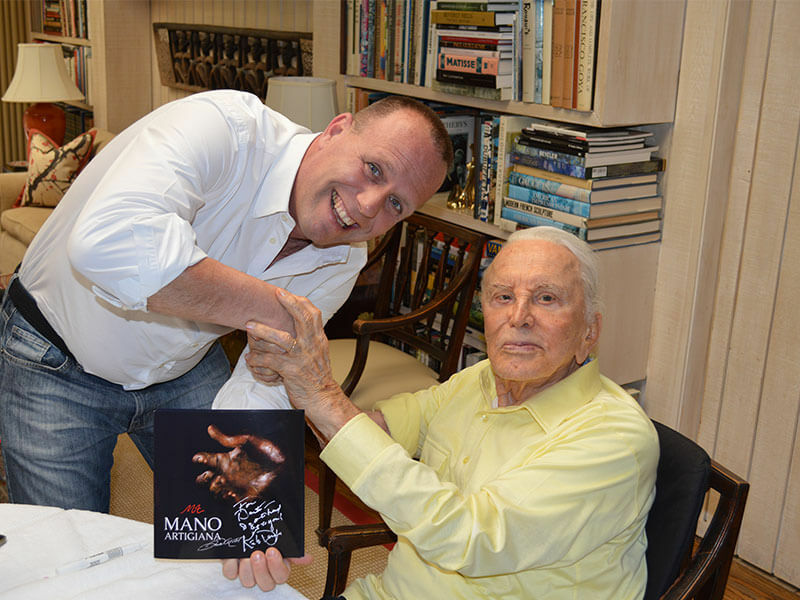 Kirk Douglas’ wife receives us, smiling, stunning ninety-year- old. She surprises me with her familiarity, her words: “Dante, Maestro, welcome please take a seat” all in Italian. Personally I think “Maestro” is a little over the top and in this situation a little out of place. There is one Maestro in this home and he is tremendous. I think to myself that I have to grab my ego, fold it tight and put it away for good during this meeting. His wife happily shows me the huge article dedicated to her husband on the paper Repubblica, still proud of him. Then as the star that he is, he walks into scene, knocks on the living room door where we are sitting. It opens up, silence…the door closes. Is him Kirk Douglas in front of me with a yellow shirt, white long hair pulled back like an Indian and his unmistakable face. “Dear Dante, welcome”. I hug him, I’m so nervous. But he puts me at ease with his aura. He tells me he read my project, he’s excited and wants to start right away, curious of how his hand is gong to be made. 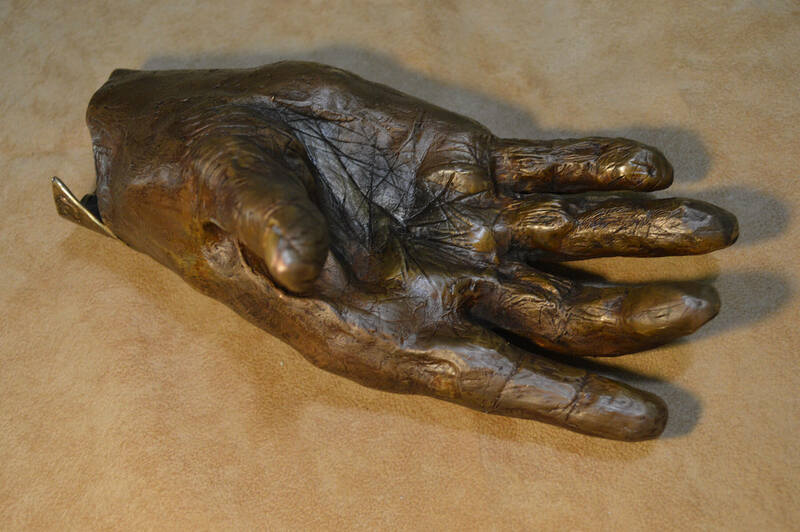 I begin by telling him to think of how he wants the hand to stand as a sculpture, after playing around with the positions of his hand and looking at the reactions on his face we decide for maybe the simplest one, the giving hand, at the moment of giving. As if this 99-year- old man was still willing to give a hand to the characters he played, the ones that will live after him. We begin. I mix the silicone and when I grab his hand between my hands to start the mold he begins to relate cinema stories that he lived in Rome. Private events with Fellini, Mastroianni and then the biggest twist, my heart is filled with joy, Kirk Douglas starts to sing. I’m sitting there making the mold while my ears listen to “come è bello fa’ l’amore quanno è sera, stretti stretti, co n’a pupa ch’è sincera, … e le stelle, … Che te guardeno lassù. Non so’ belle come l’occhi che c’hai tu, …I get carried away and I’m singing with him, excited, I think about Anna Magnani, about Rome. About how important our culture is, how important is it but above all how beautiful it is!! How beautiful he is. Relaxed and happy, having a good time remembering his moments in Rome during the days on the movie sets. Then he looks at me in the eyes, I think to myself could I have hurt him while doing the mold? But he’s looking for my complicity to start singing. Mamma..just for you this song flies. Well okay then, I think they’re teasing me. Kirk Douglas sings one more song and when he’s done a dedication to my mom, Livia. Well Mamma this time we went over the top. The mold is done; my job was surrounded by emotions and now has come to an end so I try not to impose and leave, but he grabs me by the arm and says to me: “ Dante wants to go home already? Stay with us, my son Michael is coming over for dinner and I want to introduce you, we could also do his hand, The Artisan Hand and then we can sing a little more. If all this wasn’t recorded it could have been a dream, but I have the video, the most important thing is the emotion that is in my skin, of this unforgettable day. 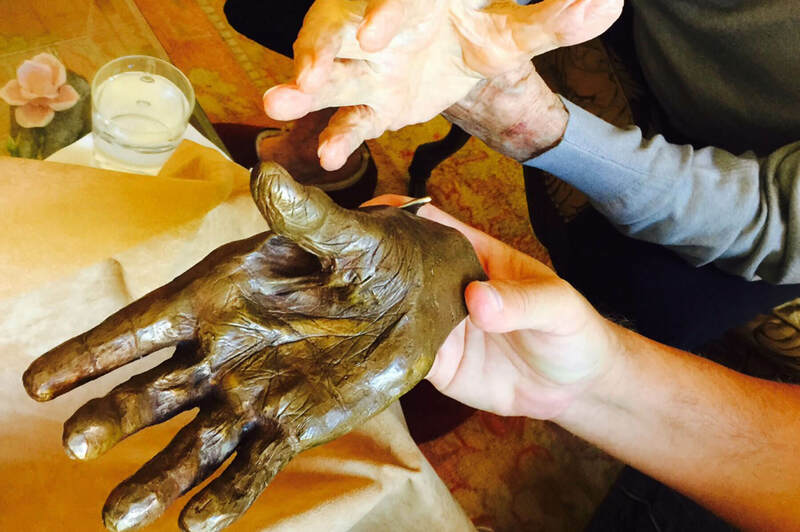 I proudly tell this story, for once due to that ego that I put away before meeting Mr. Douglas and also for my project of Mano Artigiana, which besides giving me this sculptures it, gives me these incredible emotions. Also to be part of this culture, the Italian one, which can’t be forgotten by the last Hollywood legend. Ladies and gentleman: Kirk Douglas.